Took the first steps towards growing some tobacco next year on our property in Southern Wisconsin. This will be my first ever attempt at gardening, and therefore necessarily at growing tobacco, so there will likely be some hilarious amateur mistakes you all can learn from or laugh at or sympathize with. Step one was to mow down a patch of the overgrown hayfield that is our land. Step two was to rake all the cut grass and stalks into an even mat over said patch. Step three was to take a soil sample for testing. Finally, black plastic was laid down over the area and weighed down. The plan here is to kill and turn to mulch all the plants formerly growing there, which are all suddenly considered weeds now. If the soil test shows that I need to add anything to make healthy soil for growing tobacco, I will add that material and till it in come spring. If the soil is ok, I will lay down mulch and try no-till gardening as it seems a little easier during the season and much better for the soil long term. 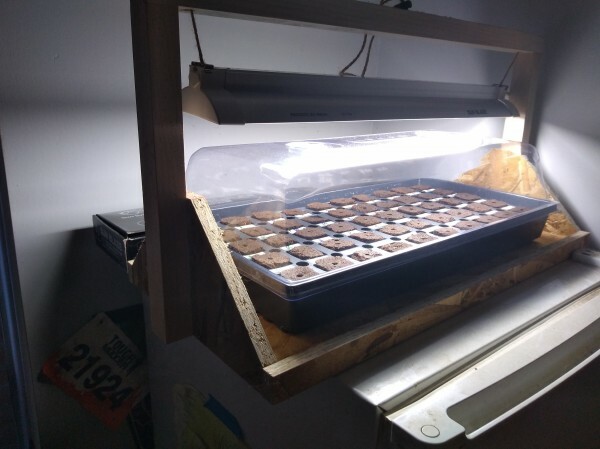 In a few months, I will order seeds and start growing them semi-hydroponically under lights at home for transplant in spring. Sounds like a plan! Keep us updated. Have you picked your seed out yet? Got them to start fine , I had a nice green carpet , if I let them dry a bit with better drainage they would have stretched and deeply rooted . But alas , I was overzealous with my water spritzer and while they thrived , they got no bigger than sprouts .. I haven't. Research into what I might want to produce has been slow, but delicious! Most likely it will be a couple of burley types and a couple of virginia types, just to see what takes. 1. Keep the plants alive. 2. Experiment with curing methods. 3. Produce something I can smoke without making faces. 4. If everything else goes well, and I feel in control of the final product (not counting on it), I would like to use some of the other resources on the property to contribute to a blend or two. I think a honey and black walnut aromatic could be nice. As well as perhaps trying to smoke and/or flame cure some stuff with some wood from the land. There are a lot of old, accidental, unproductive fruit trees that need to come down. They are easily prone to dampening off. So yeh, keep the soil moist but not wet. I usually stretch plastic wrap over the seedling tray to maker it more like a terrarium, to keep it from needing watering. If you are going hydroponics, keep in mind that the roots they grow in hydroponics will not be the roots they need when you transplant them. But, you probably know that. 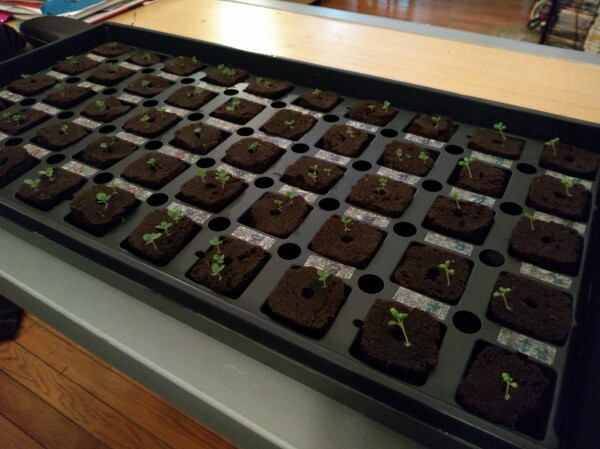 I picked up a half dozen varietals from eBay sellers to set up a small matrix to see what would grow well ... but alas , the best laid plans of mice and men. Shouldn't you be tilling and amending the soil this year , to be ready for spring ? I picked the last of my tobacco Saturday. I will till it this week, and plant peas in the beds. I almost wrote "Pease," ha ha, which would be cool if I could just plant some Haddos Delight or Stonehenge Flake. Is that for nitrogen fixing ? I planted oat grass a few years back , seemed to improve the soil . My experience is that legumes don't seem to add as much nitrogen as some suggest. But, it is good to rotate in a cover crop, just to keep it alive with microbes and such. I sometimes will grow Turnips in the beds through the winter, and then just till in the turnips that we don't eat in the Spring. Killing the hay to turn it into mulch/compost is my attempt at amending the soil/preparing the seed bed for spring. I decided to forgo a cover crop, based on nothing, really. AG/gardening info on the interwebs is copious and contradictory. 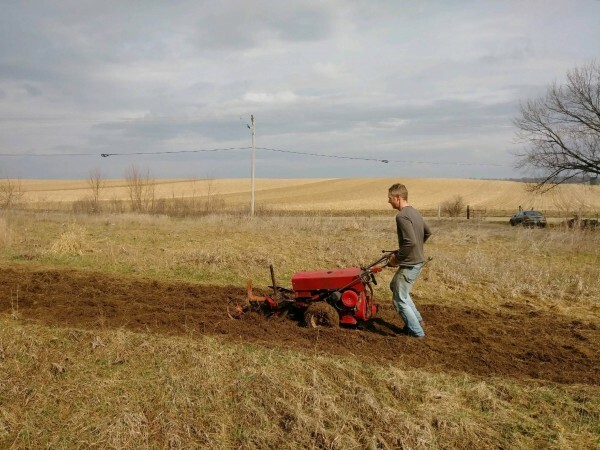 Tilling practices have changed vastly over the last several decades. Sometimes it's counterproductive. Chili- You may be able to get some help from your local Ag Dept. or Master Gardeners, depending on where you live. It all really depends on your soil make up. This is why I suggest everyone who wants to farm to join your local cooperative and take classes. Take some of the guesswork out of the work, and know for sure whether tilling is right for your soul. Not to get too off-topic, but yes. Like most things I've never needed to think about before, it seemed to me like all the tools to turn over earth (plows, discs, harrows, tillers, cultivators) were available because it was some kind of order-of-operations problem. It's much more of a what are you starting with - what do you want to end up with - what do you have kind of matrix-y question. In the end, I chose to kill down the hay with the tarp over winter instead of plowing it under now because it was easy to do. Update 1/1/19: Soil test sez good N, Low P, Low K. So when the ground thaws, a couple weeks before planting, I will pull off the tarp and turn in some potash and fertilizer. I will be picking up a seed starting "hydroponic" set up from a Brew and Grow store in town here for $100-150. Most of the cost of that is in the lamp and the prepared trays. You could accomplish the same thing for probably $25, but I am hoping to use this for tomatoes as well as being able to hang on to it for a few years. 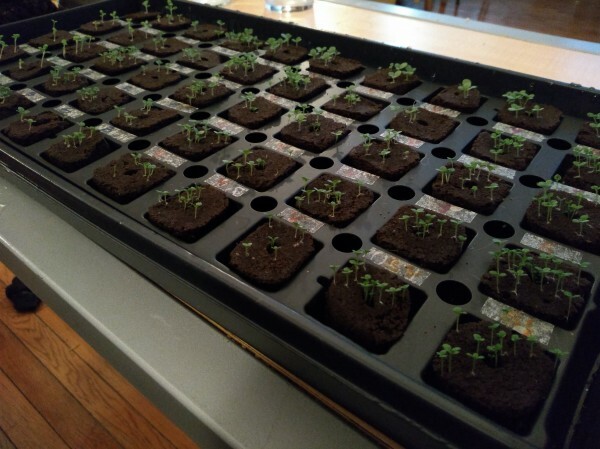 I'll order seeds by the end of the month and start 'em soon after. I still have no real clue what to order beyond "a coupla virginias and a coupla burleys". The disconnects between planters - graders - blenders - consumers is like international trade. Very different words to describe the same thing. Or, PM me, I don't have a lot of seed varieties on hand.. maybe just 30 or so. I'll be interested in this, Lucky. I have 5 acres just south of the WI border, near Harvard. I've been trying to sell it for five years with no luck and it's costing me damned near $2k/year in taxes. It would sure be nice to get SOMETHING out of that albatross. Wow, nice setup. Was hydroponics suggested to you by someone? Just curious. Hydroponics is the way to go. Whenever I go to incidences of "grow" operations going bad I look at how the "crop" is being handled. The high end operations are all hydroponics. The low end "slash and burn" "grows" are 5 gallon shrub buckets with drip tubing that originates in a shower stall with bigger bucket of chemicals to siphon. btw, the fires are always the overtaxed air handlers installed to cool the "product". Hydroponics just seems costly for a plant that just stays in the pot for a few weeks before getting planted into the ground. Or, are you going to grow the plant this way for the complete season? Like I said above, this is my first ever gardening project. So it is very likely that I got suckered by what appeared to be an "easy, all-in-one" system. That said, The lamp was 45 and the Rapid Rooter thing was 25 from my local brew and grow. The guy said it was probably the closest thing they had to a 'complete intro kit'. I made the carrying tray/lamp support out of scrap in less than an hour. I do not plan on growing hydroponically for the whole season. That would be a ridiculous waste of tiny city condo space and thousands of dollars of tents and what-not. 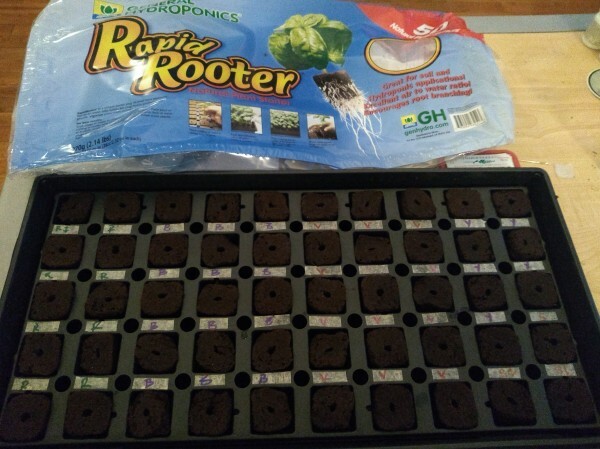 I started these seeds, which I was gifted by Jitterbugdude (Thanks again! ), technically a couple weeks early. If they take, great! I'll move 'em into little pots when they're too big for the tray. If they don't, I'll get a second chance to start a different batch of seeds and still have enough summer to attempt transplanting. If Jitter suggested the hydroponics, then it must do something, but for the most part I have found that tobacco grows really well in just about any dirt, even sand. I'll be interested to see how it performs. Twasn't my recommendation. I just plant mine in regular trays with 72 cells each. For about 5 years though I grew mine in float trays like the big boys do. Edit: I'm looking at that picture. Is that really a hydroponic set up? Is that really a hydroponic set up? I just figured he wasn't showing the reserve tanks or buckets and pumps. Jitter gave me the seeds, for which I am very grateful. He didn't suggest hydroponics or any other seed starting method. I arrived at hydroponics on my own out of curiosity. As I have never gardened before, I didn't have any potting soil or trays or pots or tools or miracle grow or anything to start plants in. So I was free to try anything. This seemed neat. In both the science-y and organizational senses. If you end up not liking the set-up for tobacco, then you might want to consider growing some greens in it, under some netting. My neighbor is rocking the cabbage and lettuces, without a single bug. Lucky, I will be paying close attention!! I can kill plants just by looking at them. However, I don't usually associate a tobacco crop with Wisconsin. It will likely grow, but the season's short. However, it surprises many that Connecticut is a big state for cigar wrapper leaf, that is also used somewhat as a pipe tobacco condiment. 1. You can grow tobacco anywhere you can grow tomatoes. The historical association with it being a Southern crop is because of the late season weather conditions there being best for air curing, which is not a concern if you are flue or fire curing in a container you can control with modern technology. A lot of cigarette Virginias are grown in Saskatchewan, for example. 2. Wisconsin, specifically Rock County (About 20 Miles due East of our property), has been a center of tobacco production for longer than it has been a State. There is still an STG buying and processing facility in Stoughton, and there is even a Burley Variety named for the State. It was bred to be used for cigar binder with lower grades used for filler and wrappers but was also used in cigarette and pipe tobacco blends. Canada and the Ukraine are where we get most of the bright yellow, citrusy, sweet Virginias. Whereas North Carolina and Virginia are known more for their earthy Virginias. Tobacco has been more glorified in certain areas in movies and such, but more factually tobacco is grown everywhere. Also, I have sprouting seeds! Three days in and some of them are already opening up and sending out little fuzzy feet! To answer an earlier question, the peet cubes are just touching a tray of standing water. I don't think it's a true hydroponic system. A problem I had last year was dampening. I had let the soil get too moist and the stems of the seedlings just crimped and fell over. I have learned to keep a fan on them to prevent this. A fan moving the seedlings also strengthens the stems, and you will get stronger plants. Or, I did, anyways. I've heard of the fan trick as part of the tempering process to make coddled hydroponic or greenhouse-grown plants strong enough to deal with the real world, but not until you get your first true leaves. I will definitely keep an eye on my tiny stems and the moisture level of the peet cubes. That kind of thing is why I started extra early this year. If I need it, there's time for a second attempt. I'm sure there will be plenty of opportunity for me to screw up throughout the season, too. I'm in no hurry myself. I just planted green peas in the beds that I use for tobacco, so I will let them run their course before transferring tobacco into those beds. And, each year I always tend to have enough time to run two crops... if I wanted. I still had burleys growing up until January. I am going to let you have the spotlight this year. So, I won't run a separate thread for my crop this year. 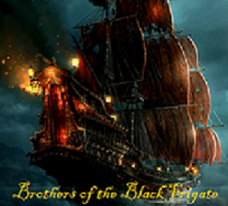 Plus, it would be boring to see the same type of pictures run again by me. What varieties are you planting? I'm anxious to see what Jitter suggested. Thinning has always been hard for me, whether it is tomatoes or tobacco. It's like taking a gamble that the tallest one will be the best one. Last year, the dampening happened right after I thinned, and it triples the regret for not waiting to thin out the plants. The death of seedlings after emergence or transplanting is called postemergent damping-off and is the condition most often identified as damping-off (although this symptom may also be caused by maggots). Most pathogens that cause damping-off diseases can also cause disease as the plant grows to maturity. And I pray you don't get Fusarium wilt. Worse than damping off disease, but you're starting with fresh potting soil, no? Used by growers for diseases caused by pythium, fusarium, alternaria and more. Commonly found throughout the United States, Fusarium wilt is a soil-borne pathogen that attacks potato, tomato, eggplant and pepper plants. ... As the disease progresses, the younger leaves will also be affected and the plant eventually dies. Mine was obviously too moist last year. I was using a new starting tray that I wasn't used to how it drains. I won't have the problem this year. And obviously, his is an all new set-up. Even though I’m not a grower these threads are interesting to follow. I enjoy knowing people are out there who put in the energy to grow their own. Cosmic, while I can’t speak for everybody, it would still be nice to see some more of your endeavors. With the seeming shortage of Yenidge, a few months ago I acquired some seed that I plan on setting to dirt. It will be just a little back yard crop, maybe even containers, but what the heck. The worst thing that could happen is that they die, and I have to open a jar of something and start over. I celebrate your successful attempts; every day we see the need for more celebrations of the small winners in the world. Thanks for all the encouragement, fellas! So far, this system has been completely passive. Because it's under a clear plastic lid, I haven't even needed to add water. Since "planting" about 10 days ago, this thinning operation has been my only intervention. I had read that I needed to be super careful with the tweezers. So much so that I actually started the process using two q-tips like chopsticks. That didn't last long, though. To answer some previous questions: The 'hydroponic' kit is new, single-use peet cubes. I assume they're sterile, but I don't know for sure. So hopefully I won't have any disease issues. There are a few cells of Rustica, two kinds of Virgina, one Burley, and a coupla Semois. Those are the seeds Jitter sent. Cosmic, Thanks for the spotlight, I suppose. Although I will continue to keep your previous year's grow-logs bookmarked for reference. Thanks for having done that, it was absolutely responsible for inspiring me to undertake this project. Update without pictures: Did a second thinning operation. Down to one plant in each cell. Picked some more centered ones over some healthier looking ones, we'll see what happens in those cells. All the rustica is laying down, but the Virginias and burleys are growing straight and tall. Not sure what that implies. Finally needed to add water to the tray. 3 weeks in. Good luck. I've been doing plants as my career for the last decade or so, either landscaping or gardening or veggie farming or restoring prairies, so this is definitely something I want to try. We just bought our house though, so the outside work is lower priority than the inside work for a while and I don't think I'll get in a crop in this year. Local guy here who has a little farm grew a couple varieties and I tried one. Better than the worst tobacco I've smoked for sure, and it really got me thinking about the possibilities. I don't know anything about the curing process, but I'd have some time to do the research. Wonder if I can hang it down my chimney and smoke it with cherry wood from the wood stove? Have any plans for that end of the process yet? All the rustica is laying down, but the Virginias and burleys are growing straight and tall. Not sure what that implies. You don't still have the plastic dome lids on do you? If so, the extreme humidity will wilt then kill all of them. Did the rustica ones fall down because they elongated too much? Seedlings hypocotyls will elongate like crazy in high temperature(heat actually inactivates the plants light receptors making them think there is no light and thus they start elongating) and humidity which will make them very flimsy with a tendency to fall down, and even more so of the light spectra of your lamp has quite a bit of far red light in it. I do still have the dome on, and the whole thing is on top of a refrigerator, so it's getting heat from that and the ceiling-mounted radiators (garden unit in a big condo building, it happens here). Only the rustica is laying down, but I will take your advice to heart and remove the cover. This is so cool, can't wait to see how it progresses. Good luck! FWIW, rustica goes nuts in our SE Wisconsin back yard. It's always been for decorative purposes, but after seeing this thread, I'm starting to get funny ideas... Well, that started long ago, but you know what I mean. Big next steps! Plowed under all the kind-of composted materials that I had tarped over in the fall. I might be using this technique again in the future, but I will definitely not be using that same black plastic material. It shredded itself into tiny pieces out there. I spent two hours on hands and knees picking bits of it out of my patch. Wouldn't want to plow it in and loose my organic status! The plants are... alive. I can't say they are thriving, though. I have done some more reading and figured out what I was probably doing wrong (all obvious stuff if this weren't my fist ever gardening project). I will start another batch of seeds just to have a back up. Transplanting to the field in two weeks! Very interesting tiller. You are going to beat me to planting. Mine are still in the small cells. And, the beads are full of peas. I won't plant mine until the end of April, maybe a week or so later. But, we have long summers here. That, my friend, is the pride of Appalachia: the Gravely Walk-Behind Tractor running the rotary plow attachment. Perfect for small acreage farms and hilly places. I am only a little bit sore and bruised from wrestling guiding that thing around over the weekend. Sure beats hand plowing, tilling and grading! Good luck with the plant out!